This month I'm participating in a blogging challenge with my friend Carol at GirlGadabout.com. Today's prompt asks us bloggers to write about a person we admire. The woman who immediately came to mind was Jen Hatmaker, even though she is constantly messing up my life. First, she had me eating a horribly boring diet for 21 days. (I never want to eat almonds again.) Now, thanks to her, I plan to give away 210 of my possessions by the end of the month. I had been planning to do this for a while, ever since I started reading Hatmaker's book earlier this year. 7: An Experimental Mutiny Against Excess, details Hatmaker's attempt to fight greed, materialism, and overindulgence in hopes of living a more Christ-like existence. The idea was to choose seven areas -- food, clothes, spending, media, possessions, waste, and stress -- and spend 30 days on each topic boiling it down to the number seven. Only eat seven foods, only wear seven articles of clothing, and spend money in only seven places. Her plan also called for her to eliminate use of seven types of media, adopt seven green habits, observe “seven sacred pauses” and give away seven things each day for one month -- which is what I'm attempting for April. My plan was to do this months ago. I was going to set up a box in the teacher's lounge at work and bring in items daily after raiding cluttered closets and overstuffed drawers. But things kept coming up and I could never get around to sorting through my stuff. And now I think I know why. By giving all those items to co-workers I was just going to transfer them from one person who had way more junk than she needed to another. 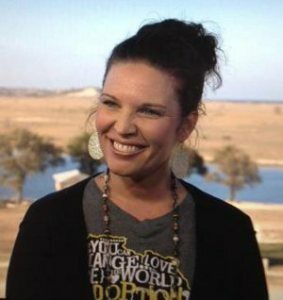 I believe God wants me to give those items to women who really need them and recently it was placed on my heart to do just that, all thanks to the writing of Jen Hatmaker. Jen has inspired me to seek out women who will benefit most from the things keeping me from living the streamlined life I desire. In the meantime I'll be stashing stuff on this futon. For the sake of my neat freak of a husband, who's being driven crazy by this pile, please let me know of any women in Birmingham who might benefit from this possession purge. Oooh, that is quite the concept. I'm gonna have to study that and perhaps try it for myself. That's an awesome idea! I couldn't just wear seven items of clothing, but I could stand to part with some. Oak Mountain Missions in Pelham offers clothes, furniture, and food for people in need. It was begun by a retired couple and still is pretty much a volunteer operation I believe. Bless your heart for doing such a good thing.